Having traveled to Agua Salada, Honduras I have come to appreciate the complexity and necessity for medical services in this area. Being a resident physician in the United States, practicing in Agua Salada was an extremely humbling experience for me. Many of the luxuries we rely so heavily upon were not an option, but our ability to help the residents of this community relied solely on our primitive medical training, mainly our history and physical exam skills. Even though I had limited verbal communication with the patients and local residents, I came to appreciate and interact with everyone as if there were no language barriers. The residents of Agua Salada appreciate the resources and medical care that Shoulder to Shoulder provides, but more importantly, I feel I grew as an individual and physician during my short stay in Honduras. 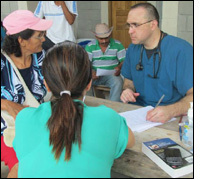 There is a symbiotic relationship amongst the medical staff from the U.S. and the residents of Agua Salada. Our role is clearly defined as simply providing medical care and services that are not available in this region of the country, but there is a clear educational, cultural, and familial lesson for all the medical staff and residents of the United States. It would be my wish for every citizen in the U.S. to travel to Honduras if only to experience the harsh living conditions that so many individuals in the U.S. have never experienced. Knowing that the families in Agua Salada must encounter harsh obstacles on a daily basis, I came to realize that no matter the conditions or surrounding environment, the residents of Agua Salada were appreciative and extremely happy. Living in primitive conditions without the luxuries that we all to often claim to be necessities, I have come to realize through indirect teachings from the residents that happiness does not require all the latest fashions and high tech gadgets, but rather a strong relationship amongst family members, and satisfaction with what you have without dwelling on the things that are not present.